If you were hunting down the perfect place to live to a ripe old age, you probably wouldn't pick Hackney. Hackney is one of the most health deprived areas in the country. The majority of the borough falls within the top 30-40% of health deprived areas in the country and rates poorly on most health indicators. Average life expectancy is 77.7 years which is below both the London and England averages. On a national scale, the borough ranks 218th out of 352 local authorities for women and 316th for men. So it might come as a surprise to discover that the world's oldest man was born and raised in Hackney. He's 113-year-old Henry Allingham - last survivor of the Battle of Jutland, last surviving founding member of the Royal Air Force and one of only two surviving WW1 veterans. Henry was elevated to the official status of "world's oldest man" last Friday, on the death of the previous Japanese incumbent. You might have seen him laying a wreath at the Cenotaph last November, because he still gets about a bit and commands the respect of a grateful nation. Admittedly Henry doesn't live in Hackney any more. His family moved south of the river when he was only 12, and today he lives in a servicemen's home near Brighton. But he's a Hackney boy deep down. So I thought I'd hunt down his childhood home to investigate the secret of his longevity. Henry Allingham was born in Clapton on June 6th 1896 (that's D-Day, but 48 years too early). According to the Hackney council website - and they ought to know - Henry's childhood home was on Harrington Hill. That's not at the "Murder Mile" end of Lower Clapton, it's in leafier riverside Upper Clapton. North of the pond, north of the station, in a sloping hinterland of residential avenues and more recent apartment infill. Much has changed round here, and Henry wouldn't recognise many surviving buildings from his time in the street, but there's still a bit left if you look carefully. Harrington Hill's a surprisingly steep street leading down to the banks of the River Lea, which you'll probably have spotted if you've ever walked along Walthamstow Marshes near the railway arches. At the water's edge on High Hill Ferry is a tiny white-topped pub, the Anchor and Hope - inaccessible from the footpath opposite but still very popular during the summer months. It was closed when I arrived, but one elderly 'resident' had made his home on the bench outside. He was fast asleep beneath a grotty black sleeping bag, and I'm assuming the bicycle (with a pannier full of blue plastic bags) propped up alongside was his too. I wouldn't give much for his life expectancy, but in this world-beating street who knows? The road's amazing in one respect, which is for the number of different architectural styles crammed into its 200 metre descent. Alas most are not lovely. I hope that Henry grew up in one of the four remaining Victorian cottages halfway up on the southern side. They're sturdy terraced homes, at least two up and two down, with brickwork cornices and characterful porches. Nextdoor are two pale modern imitations, with tiny windows and pre-built loft extensions, each with a parking space in lieu of a front garden. And everyone else in Harrington Hill lives in a flat. 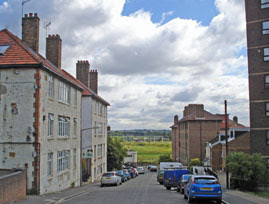 Immediately behind the pub are the five-storey brick blocks of the High Hill Estate. They were built by the London County Council in the 1930s, and replaced older Victorian stock prone to repeated flooding. And these are the relatively nice flats. A blander late 20th century block rises opposite, presenting a featureless face of wall and window to the street. Further up are a pair of older buildings with chimneystacked roofs, their exterior white paint peeling, divided up into non-luxury living spaces within. And near the summit, blocking the view east from the primary school playground, rises a particularly charm-free eight-storey tower. It's fortunate that Henry escaped when he did, else some 1970s housing officer might have allocated him a fully-plumbed prison cell in the sky. 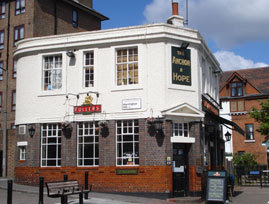 To get a proper flavour of Henry's childhood home, check out Baker's Hill which runs parallel down to the Lea. Two chunks of Victorian terrace survive intact, admittedly now with proper fitted kitchens and inside toilets to make home life considerably easier. And one other feature remains mostly the same, which is the great view out across the flat green expanse of Walthamstow Marshes. Maybe it's Harrington Hill's refreshing riverside location that's the true secret of Henry's longevity (or maybe I'm reading too much into the whole thing). Whatever, I hope that locals at the Anchor and Hope will raise a glass to the continued good health of an improbable child born right up their street. Live long in Hackney, and prosper.